I’ve never really been a TV addict. Oh, I’ve watched plenty of television fare in my time, but I’ve always been more interested in comics and books, I think, because of their permanence. TV, until the advent of the videocassette recorder, had been extremely ephemeral. The ephemeral nature of TV, which continues even today because of its incredible volume and prevalence in society, is the basic tenet of Postman’s argument here. 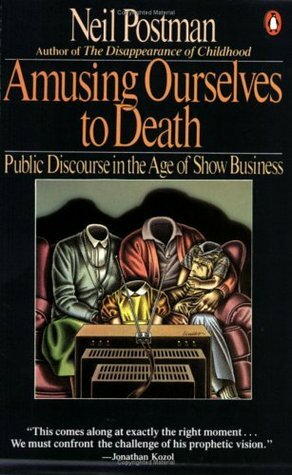 By its very nature, Postman says, TV is incapable of presenting true public discourse, which relies on arguments that don’t necessarily have the entertainment quotient necessary for the medium. 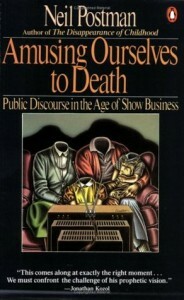 The rest of the book expounds on this, looking at the past history of public discourse in America up to the time this book was written, which was ten years ago. In the last ten years, TV’s influence on public policy has even increased, and it would be interesting to see what Postman has to say about it now.